1400 start time on Sunday (18 August) so try to arrive early!! By Public Transportation: Take Orange Line 3 to Tongnimmun Station (#316)(600 won). Leave Subway by Exit 5. Continue walking towards the north end of the Tongnimmun Park (See map). Wait at the end of the park by the first street crossing for driving MASHers for a ride up to the hash site. If you arrive early, you are assured to get a ride. If you don't see any MASHers in cars, you have arrived late. Call 011-9703-0026 and we'll send a chauffeur to pick you up. What could be simpler? 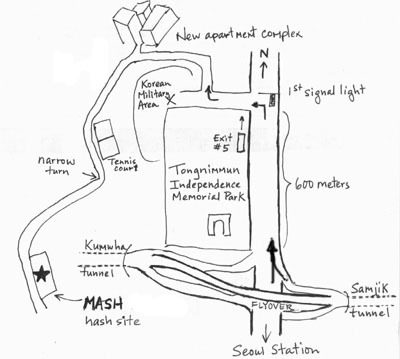 By Car: Locate the Tongnimmun Independence Memorial Park on a map. Once you are oriented, see map for detailed approaches. About 600 meters north of the high flyover (between Kumwha and Samjik tunnels), there is a traffic light for a left turn. Get into that turn lane as soon as you are next to the park. After turning left, look for MASHers seeking a lift up to the hash site!. Proceed up the road as shown on map (approx 1 km from left turn). Parking is limited but not impossible. You can leave a bag and any post-hash goodies in a car while running or walking. MASH will provide the usual drinks and chips, and there will be a grill for the BBQ minded afterwards.